The 2018 edition of Mount Kilimanjaro expedition is about more than honouring former President Nelson Mandela and keeping girl-children in school. A 100 trees will be rooted in African soil, in a bid to help save fast-melting glaciers. Late racing driver Gugu Zulu will also be remembered. Zulu died during the 2016 trek up the mountain. His wife Letshego Zulu kept her promise as she returned in 2017 to complete the journey she and Gugu had started. This year she’ll help re-green the mountain’s slopes. “This year I am going back to continue the legacy of my late husband. I am going to plant trees and why trees you may ask, trees are a living legacy. They live for many years to come and with that Gugu will be remembered for many years,” says Letshego. Sarah Scott from the Kilimanjaro Project is working tirelessly to revive the once lush vegetation. “She came to me with this grand idea of planting a mini forest in memory of Gugu and I thought that is the best way to remember Gugu. 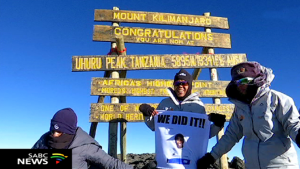 I can always go back to Kili to climb the mountain in his memory but something as grand as a tree I think is the best way to remember him,” says Letshego. Launched last year, the initiative aims to reverse the effects of climate change. “Because of deforestation around the mountain there is less rainfall around the mountain. The cloud cover creates a blanket over the mountain allowing it to be protected from the sun because of deforestation the mountain has spent more face time with the sun and therefore the glaciers are not melting they are evaporating,” says Scott. The goal is to plant 1 million trees this year. Letshego will be joined by her and Gugu’s three-year-old daughter, Lelethu. The post Trek4Mandela to help save fast melting glaciers appeared first on SABC News – Breaking news, special reports, world, business, sport coverage of all South African current events. Africa's news leader..